One of the key features of the Wet Tropics Plan for People and Country is that it is online, enabling it to remain current and accessible to anyone. In addition to the online Plan, a summary document has also been created which provides an overview of key components of plan development and the regional and community priorities identified through the planning process. 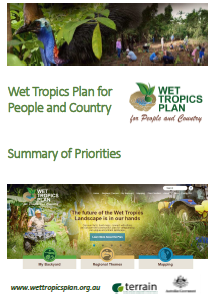 To download a printable version of the Wet Tropics Plan for People and Country Summary of Priorities, click on this link.